After the first practice session was washed out by a downpour, the second was run on a drying track, with the cars getting faster with almost every lap. The Ferraris battled for a while over who was going to be fastest but then Raikkonen put in some very quick laps that left Massa well behind. First blood to the Finn, a fitting celebration after the announcement that he will be with Ferrari through 2009 and 2010. 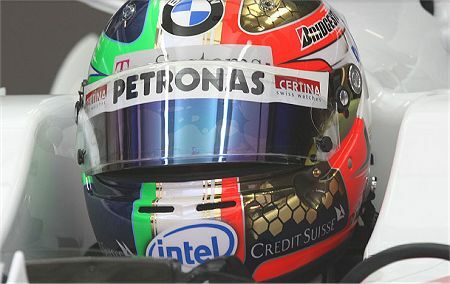 Monza is fast getting a reputation as a Beemer circuit and Kubica confirmed this by setting the first sub-1.24 sec time of the day. He sat there at the top of the time sheets for most of the second half of the session, was joined by Heidfeld to give a BMW 1-2, until near the end when Kimi got serious. The Beemer boys remain second and third fastest, however, and must be a threat for the win on Sunday. Up next was Hamilton, looking smooth and confident in the McLaren. It was interesting to compare the in-car shots of Lewis and Kubica, the McLaren seemingly on rails and hardly noticing the kerbs, the BMW nervous but giving a much greater impression of speed as it twitched its way through the corners. The struggle between these two teams in qualifying is going to be fascinating. Rosberg somehow managed to get the Williams around the circuit in the fifth fastest time, a feat that I doubt he will be able to repeat tomorrow. He put in some stirring laps, bouncing the car over the bumps, and left his team mate, Nakajima, way behind in 16th spot. Massa followed in sixth and seemed to be having difficulty in getting the best from his car. If he is not able to get closer to Kimi in qualifying, the question of Raikkonen helping him in the race will be meaningless - for that to happen, he has to be ahead of the Finn. Ferrari are still saying that Massa is not yet their bet for the championship but the reality must be that they hope Felipe puts everything beyond doubt this weekend. On this showing, that is not going to happen. Heikki Kovalainen was another who was having difficulty in matching his team mate, as demonstrated by his seventh quickest time. It is likely that he will have things sorted out by the time qualifying arrives, however. And behind him, Webber was the quickest of the Red Bull/Toro Rosso drivers. Surprise of the second session was Adrian Sutil, who had been quickest before the rain came in the first session. To set ninth fastest time on a drying track in a Force India was quite an achievement and must increase suspicion that the Ferrari engine has considerably more power than the rest at the moment. Fisichella was not far behind, forming a sort of midfield with the drivers of Adrian Newey chassis. The Renaults looked awful, not even Alonso managing to get higher than 18th, and the Toyotas were nearly as bad. One can only presume that much work overnight will move them up the order a bit but, for now, the Honda team are ahead of them. Qualifying tomorrow will be a three-team affair, I think, perhaps even a four-driver battle. And it will not be the usual mix; expect Raikkonen, Hamilton, Kubica and Heidfeld to be the ones arguing over pole position. If the track is wet, all that could change but not by much. Those four are the wet weather experts this year, with only Alonso on a par (and it looks as though the deficiencies of the Renault and its engine at Monza are just too great to be overcome even by him). It is looking good for BMW, however. They have been good on this circuit before and this could well be their moment to make the big breakthrough. The BMW supporter has to be an optimist, John. But it's not just optimism - the Beemers are usually slow on a Friday, as they like to get their race set up sorted first, but here they are, both of them (unusual enough in itself) with second and third fastest times. That indicates that the car is quick, not just the driver, and, if they follow their usual form, they'll be even faster tomorrow. If I were being really optimistic, I'd guess they'd lock out the front row. A supporter of a team other than Ferrari or McLaren hoping for a podium position in Monza has to be a dreamer, and a very accomplished dreamer, at that. If Hamilton can refrain from short-cutting the Ascari, Rettifilio or Roggia chicanes he has an excellent opportunity to finish 2nd or 3rd. A red car must win in Monza! That's the way the script runs, Green Flag, but it doesn't always turn out that way. I think it's going to be a three-way battle this time and it might well be the weather that decides everything yet again. Quick Nick is my pick! Clive: I realize this is off subject, but I just read on Speed that Max is making noises about staying in office. You were right in your evaluation at the time that he'd find a way. That man drives me batty! I could be looking very foolish in a few hours time, but I'd bet on Kubica making the front row this weekend.